The Canadian airline WestJet has been confronted by paradoxes in early 2016, a period in which the company celebrated its milestone 20th anniversary. After attaining an investment grade rating from Standard & Poor’s in 2014, in 2016 WestJet has secured that coveted status from a second ratings agency, Moodys. WestJet and Alaska joined Southwest Airlines in obtaining investment-grade status in 2014, followed by Delta Air Lines in 2016. But as it marks two decades in business WestJet is facing challenges. In the short term, economic weakness in the resource-driven province of Alberta dragged down its revenue performance in 1Q2016, and in the long term, WestJet needs to ensure that the employee sentiment that helped propel it to its 20 year anniversary remains intact. It has faced union drives in recent years, which is inevitable as the company continues to expand. WestJet has evolved from a pure low cost airline to a hybrid company that caters to both leisure and corporate customers. At times the transition has not been easy on its culture. Cultural preservation will be key as WestJet forges a path for the next decade and beyond. WestJet launched services in Western Canada in Feb-2016 and was modelled after Southwest, which was then the poster child for the successful low cost model. Since that time the low cost model has changed in several ways. Hybrids such as WestJet, jetBlue and Alaska focus on low cost but attempt to create a differentiated passenger experience, and all low cost airlines in North America have been forced to court some level of corporate customer. In order to capture its fair share of revenue in the highly contested US transcontinental market, in 2014 jetBlue debuted its premium product, Mint, which features a dedicated section of lie-flat seats and closed-off suites on a specially configured sub-fleet of Airbus narrrowbodies. During the past few years WestJet has also worked to make its product more attractive to corporate customers. Among those changes are the creation of fare classes – in which the highest tier, Plus, includes two free checked bags, as well as adding more legroom, seat assignments, priority screening, premium food and beverage, and advanced boarding. In 2015 WestJet took another step to target corporate customers by blocking out the middle seat, European style, in the Plus section of its Boeing 737 narrowbodies. Orders include those placed directly by the operator and by lessors assigned to the operator, from 7-May-2016 onwards. Previously WestJet had set the new Plus configuration pricing at 50% to 70% lower than the business class on its rival, Air Canada, at a time when many corporations were prohibiting business class bookings for flights under five hours. WestJet executives recently stated that the airline's corporate passengers had grown 10% year-on-year in 1Q2016, and that Plus product sales had increased by 5.2%; “suggesting some nice upside in future periods as the energy sector recovers,” said the company CEO, Gregg Saretsky. Mr Saretsky also highlighted that some of the traction that WestJet was seeing in the corporate market was driven by its network. In early 2012 WestJet made a strategic decision to establish a smaller subsidiary to operate in markets that were not commercially viable for its fleet of 737 narrowbodies. It quickly gained employee approval to establish Encore, and the airline debuted in 2013. It now serves 32 destinations with 28 Bombardier Q400 turboprops. Encore launched its first transborder service between Toronto and Boston in Mar-2016, followed by Halifax-Boston in Apr-2016. But WestJet’s overall growth has pressured its stock valuation during the last year. The combination of capacity growth and falling unit revenue seems to have spooked investors. Originally, WestJet had targeted system capacity growth of 8% to 11% in 2016, but it has since revised its increase to a (still-healthy) 7% to 9%. 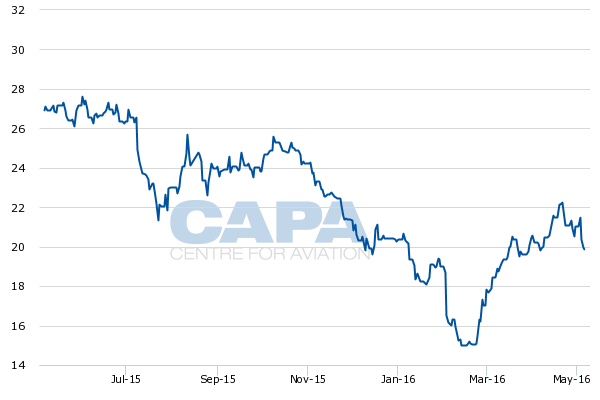 Its stock price was trading in the CAD15 range in Feb-2016, but has since recovered to CAD19 (early May-2016), which is reduced from the level a year ago, at CAD26.9. WestJet embarked on 2016 warning that its unit revenue for 1Q2016 would fall 7% to 10%, driven by weakness in the province of Alberta, home to WestJet’s headquarters of Calgary. In early Feb-2016 WestJet executives stated that 25% of the company’s system capacity originated in Alberta and 40% of its supply touched the region. To combat the weakness in Alberta, WestJet plans to cut its capacity in the region by 5% in 3Q2016. As a result of those changes WestJet’s 2016 domestic capacity growth will be reduced, from 3% to 4% to 1.5% to 2.5%. WestJet’s yields in 1Q2016 fell 11.6%, and unit revenues decreased 11%. The company is forecasting sequential improvement in subsequent quarters in 2016; unit revenue for 2Q2016 is projected to drop 7.5% to 9.5% year-on-year. At one point it seemed as if WestJet was getting some pushback from investors regarding its plans to launch new widebody flights to London Gatwick from several points in Canada, at a time when its revenues were under pressure and capacity was expanding. Most of the services are seasonal, with the exception of Toronto-Gatwick. In early May-2016 WestJet introduces 767 services to Gatwick from Vancouver, Edmonton, Calgary, Winnipeg, St John’s and the previously mentioned route from Toronto. Although it faced some scrutiny over the launch of direct long haul service from Canada to London, WestJet has always maintained that it is undertaking the expansion with older widebodies at a time when fuel efficiency is less important, and is offering multiple access points beyond Gatwick through its partnerships. Taking all those factors into account, WestJet has dubbed the long haul flights a low-risk exercise. In early May-2016 prior to the Gatwick launch, WestJet executives stated that the company was happy with advance bookings on the routes, and as long as the markets maintain their current momentum the routes should be accretive. WestJet’s foray into the trans-Atlantic market is an effort by the airline to challenge the dominance that Air Canada has exercised on some of those routes. 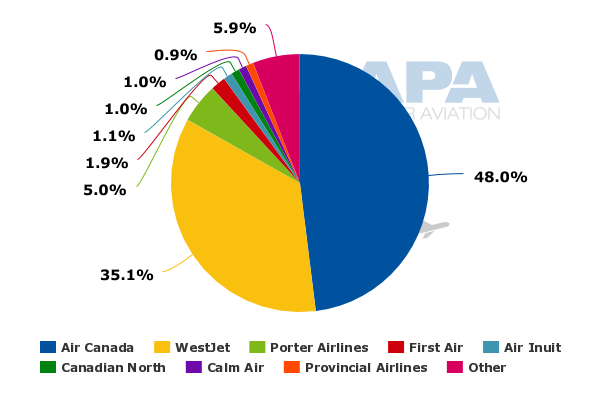 Data from CAPA and OAG for the week of 9-May-2016 to 15-May-2016 show that WestJet represents 12% of Canada’s system-wide international seats versus 37% for Air Canada. 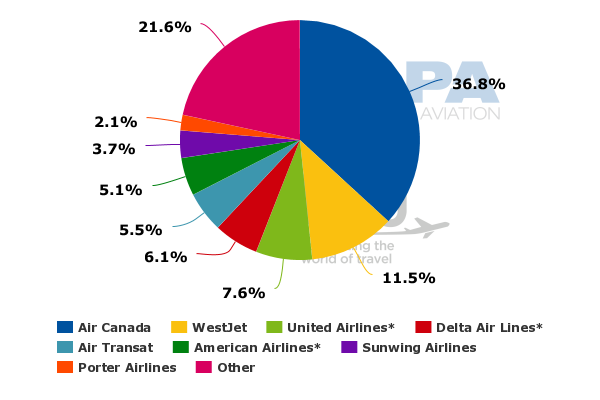 In the domestic market WestJet and Air Canada have sustained a long held duopoly, with Air Canada representing 48% of Canada’s domestic seats and WestJet accounting for 35%. WestJet’s rise to become Canada’s second largest airline over two decades deserves merit (aided in part by Air Canada’s absorption of Canadian Airlines, it should be said). As previously reported by CAPA, one advantage that WestJet has held over rival Air Canadahas been its younger, fresher image. Nevertheless, as time passes that image may be tough to preserve. Key to WestJet’s ability to sustain its positive image is maintaining favourable employee relations as its network breadth deepens. It has escaped union drives by pilots and flight attendants, which have gained momentum amid all the changes that WestJet had undergone in the last few years – the creation of Encore, the launch of long haul flights and the introduction of segmented fares. Mr Saretsky was forced to issued an apology to the airline's flight attendants in 2013, after they had had to redirect confused passengers to other areas of the cabin during the initial roll-out of the airline’s premium economy product - exemplifying the fact that the larger an organisation becomes, the greater the risk increases that front line employees – the most crucial for an airline – feel increasingly alienated from top executives. Presumably WestJet can weather the current weak revenue environment that has engulfed domestic markets in both Canada and the US. The company also obviously realises the importance of maintaining a positive employee culture, which may be its biggest challenge going forward. As WestJet celebrates 20 years in the airline business its biggest test is crafting a strategy to navigate its expansion effectively, while sustaining employee loyalty.